Bali, Indonesia. 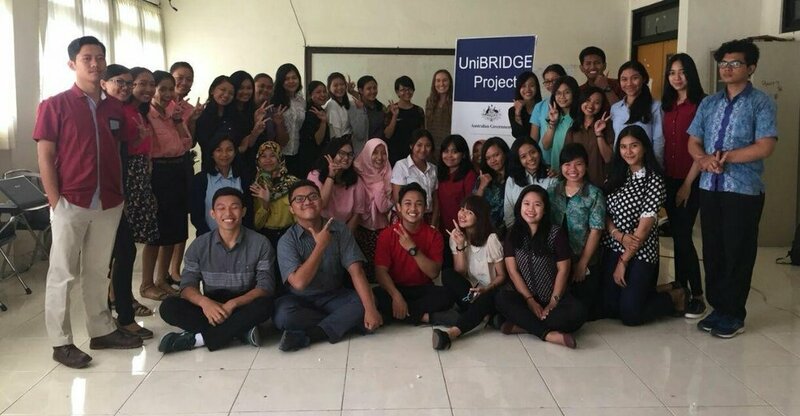 I went to Singaraja, Bali, to help UniBRIDGE Project deepen engagement between Australian & Indonesian university students. This trip was one of the best experiences I've ever had. I was so excited about the opportunity to promote UniBRIDGE Project further at Indonesia’s partnering universities. I quickly realised that this trip would be more than just a chance to get more students involved. It was the opportunity to meet my Indonesian UniBRIDGE friends, see universities in Indonesia and reconnect with the UniBRIDGE scholarship students who came to Australia last year, Lily, and Rizkhy who stayed with my family during his Sydney visit. I'm very grateful for the experiences I've been offered not only because of UniBRIDGE Project, but also my family. My interest in Indonesia and bahasa Indonesia was nurtured by my dad's love of Indonesia which also started young. He became friends with a Balinese man, Mushroom, who has become like a brother to my dad and an uncle to me. He is a tourism driver and owns a Beach Bar and Tattoo Shop in Legian. It was wonderful to be met at the airport by Mushroom and his cousin, Eka. They wanted to drive me to Singaraja themselves, so they were assured I got there safely. The journey to Singaraja itself was quite interesting. On the way, we went through a town with no Padmas, no incense and no offerings. Eka then pointed out a Christian school and church. I was quite surprised, I've always known Bali as Hindu, with their 9 gods, offerings and red, white and black Hindu blessing bands. Eka explained that this area was converted to Christianity by missionaries and was now predominately Christian. We arrived at Undiksha Edutel, the student accommodation. Ibu Arie, lecturer at Undiksha, suggested I stay there as it is close to the uni. I was surprised to find the staff couldn't speak any English, so I had to speak Indonesian whilst I was there. The staff were really friendly and always up for a chat. I had to learn the word for power plug because there wasn't one for my TV! My room was amazing, comfy and really big. My UniBRIDGE friend, Rangga took me to Kantin Tapi Bukit. After talking with him for so long via the online UniBRIDGE platform it was so surreal to finally meet him in person and to be traveling around Bali together. Kantin Tapi Bukit was amazing, it is a canteen perched on a hillside with a panoramic view of the whole of city Singaraja! I was very excited to be eating Indonesian food again too! Class workshops at Undiksha started at 8am on the 7th March. I had two classes each day for 3 days, and then small groups in between that weren't in Ibu Aries classes for those days. I woke up each morning, walked past the Indomart and bought my favourite choc milk for breakfast on the way to Undiksha. Everyone I passed on the way would stop me to say, "Pagi, apa kabar? Mau ke mana?" I had breakfast with Ibu Arie which included many different types of cakes and nasi campur before we went to the first class. It was so much fun. All the students were super excited and really eager to sign up. After every workshop, I conducted a fun quiz on Aussie slang and gave out prizes, which everyone loved. After the first day of classes, I walked back to the edutel and met my friend Rangga who had arranged to take me to a waterfall. It had been pouring with rain before he arrived but we still went. It was amazing, the waterfall was so strong because of the rain, which started again when we arrived. We were drenched through and the wind blew the water from the waterfall everywhere as well! Later that day Agus visited me at Edutel, another UniBRIDGE friend, who is an amazing athlete and has represented Indonesia in China for the Asian Games in Woodball. Winning 3 gold medals! He brought chocolate and cheese Terang Bulan, I've never had it before and oh my goodness - I've been missing out. It is amazing! I meet one of his friends, Anggre, another talented athlete. We sat and nongkrong for a while. Day 2 meant two more classes and a few little workshops for other students not in Ibu Aries normal classes. I loved seeing everyone so excited to meet Aussie UniBRIDGE members. On my last day, I had two classes, one I had already taught on the first day about UniBRIDGE so they were all online. So for something different I got them to go onto the UniBRIDGE rooms with Aussie mentor Buddy so they could get use to using the site! After the workshops on Thursday and Friday I went to another waterfall with Agus and Anggre which had a swimming pool filled with water from the waterfall! Agus had training after for woodball and invited me along to watch and try. Woodball is a new sport mixing croquet and golf and it’s really difficult. It is played on a big grass field with rope outlines and a small wooden goal. His coach was very welcoming as was his team. They taught me how to play and practiced their English skills. To conclude the session the coach did a beautiful speech to all the athletes reminding them to train hard and stay focused if they want to become elite athletes. On Friday, Rangga and I went to another waterfall which had a natural waterslide and a platform to jump off! On Saturday Rangga and I went exploring in Singaraja and went to Gramedia. We both bought the last two books, 'Aku' from 'Ada apa dengan Cinta?' before going to meet Anggre and Agus at a warung near the water. Although as usual, it started pouring and they couldn't come. So, we went to an amazing little Warung called Dapur Etnik. The food was amazing and I was introduced to a drink called Es Lemon and from then on had it with most my meals! Once the rain stopped we meet with Anggre at the student accommodation and had a nongkrong session about traveling with her and a volunteer from Allore Island, Menas who helped students with English communication practice - although everyone spoke Bahasa during this nongkrong session! There was some very interesting topics including people who would hypnotise tourists with a smoke that would make the tourist do whatever they're told to, including giving their wallets, phones and any other valuables! It was an interesting night. Sunday, I went to Legian for a few days to see Mushroom and the family as well as meet up with one of my best friends, Ellen who came to Bali from UGM in Jogja! I had a few days until I had to go to Kupang to do more workshops. Mushroom and the family picked me up from the Edutel. It was amazing to see them again and the usually long drive to Legian was made short with Indonesian lollies and more nongkrong! When I arrived, Ellen was already there. I showed her around Legian and to my favourite restaurant where I introduced her to the owner and staff who have known me since I was little! We spent three days at the beach, in the pool and exploring Legian. Eka took us to Tanah Lot because Ellen had not seen the Temple in the sea. It is so beautiful, especially at sunset. Ellen soon had to go back to class, so I spent my last two days in Bali with Rangga, Mushroom and the family. Rangga and I went to a beautiful beach about half an hour from Legian, before finding interesting warungs and another Gramedia bookshop. He took me to Mushrooms house in Denpasar for dinner, we got Terang Bulan for the 5 boys and their friends. They are all so big. I grew up with Wayan who is a few years younger than me. Wayan was training in his gym when we arrived, so we had a chat about weights and training, which was really cool, seeing how he trains and how it’s different to my training at home. It was my last night in Bali, Mushroom took me to the airport. It was quite entertaining, I got out of the car, said a sad farewell and went to walk inside and realised he dropped me off at International! He got out of the car, laughing, realising. He usually drops me off here, but this was my first time going domestic! Next stop Kupang!